West Africa There are	25 products. 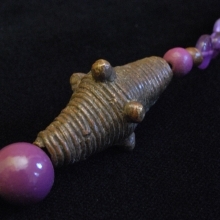 Necklace made from wood, ceramic, bronze and semi-precious stone (Amethyst). 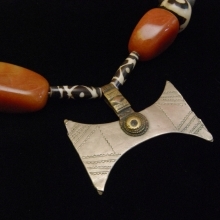 The pendant is native of Ethiopia. Necklace made mostly with glass paste beads in blue tones. There are also gems, bicolours bone of West Africa (Mali-Senegal) and two real Turquoise stone. 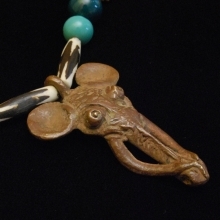 The pendant is native of Ethiopia. 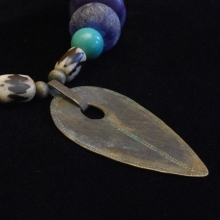 Necklace in blue and bronze tones with wood, bone, glass paste and semiprecious stone (Sodalite). 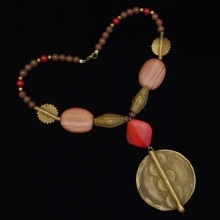 Long necklace with large pendant in Bronze of Mali. 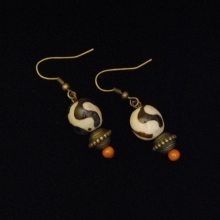 There are beads in wood, bone, colored ceramic and African carnelian. 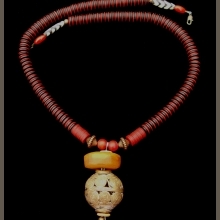 Necklace made of painted ceramic, bone, wood, bronze and glass paste. Red and orange tones. 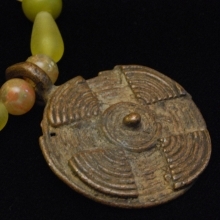 Bronze pendant from Mali. Wood, resin, bones and tinted seed beads. 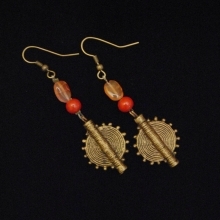 Two beads Baoule from Mali and bronze pendant from Cameroon. Necklace made of beads in wood, tinted seeds, paste of glass and resin. 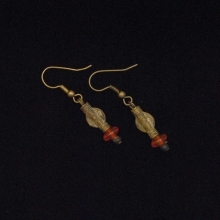 There are also two carnelian beads. 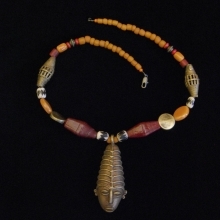 The pendant is originally from Ethiopia. 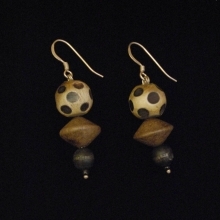 There are also two Baoulé bronze beads from Mali. Resin, wood, Agathe and Carnelian stone beads. 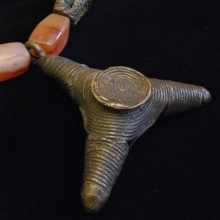 Bronze pendant "Baoulé" from Mali. Bronze, wood, bone en glass beads. Bronze pendant like a bell but without sound ! it's from Mali. 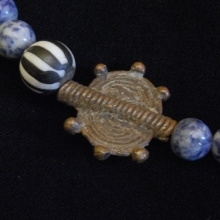 Bronze pendant from Cameroun, bone, ceramic and stones beads (Turquoise, Aventurine and Agathe). Short necklace with wood, Bronze and semiprecious stones. 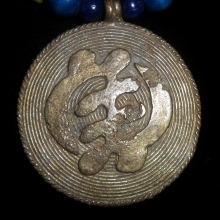 Medallion of western Africa also bronze (Mali). Stones are purple Jade. 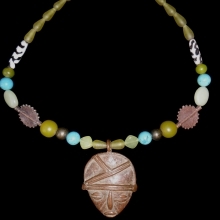 Coco wood necklace made from bone beads, silver and stone (Aventurine). 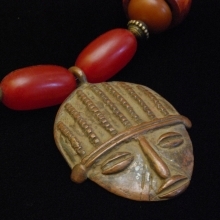 The pendant is old and African. 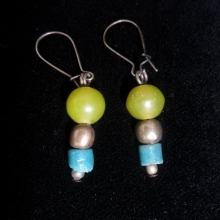 There are two old silver beads. 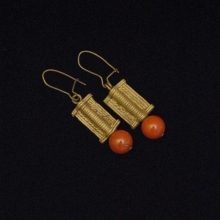 Bronze, wood and Cornelian. Nice with the following necklace : Gaïa, Fétiche, Mandala, Papaye, Alizarine, Nagalon. Bone, wood and metal beads. 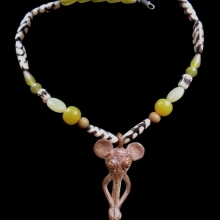 Nice with following necklace: Mam Africa and Africa. Bronze from Mali, Glass and wood. Silver and brown wood beads. 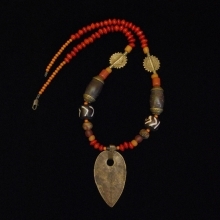 Red Jasper and Bronze beads from Mali. Simply necklace in bronze, resin, glass paste and sand, and semi-precious stone beads (jade). 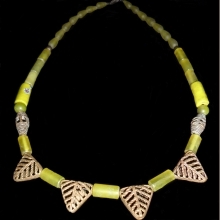 Necklace in blue and yellow tones made of bronze, wood and glass paste beads. 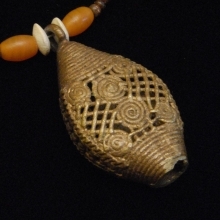 Bronze pendant from Mali. 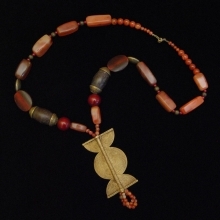 Typical West African necklace with bronze pendant, bone beads, resin beads and two Fluorite stones. Earrings made of resin and glass paste. Bronze clip. 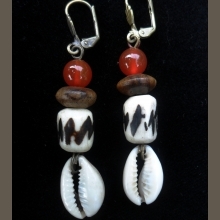 Long earrings made of bone beads, wood, shell and a carnelian.